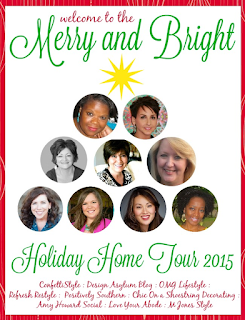 Welcome to my first Christmas home tour! I am delighted that you have stopped by. 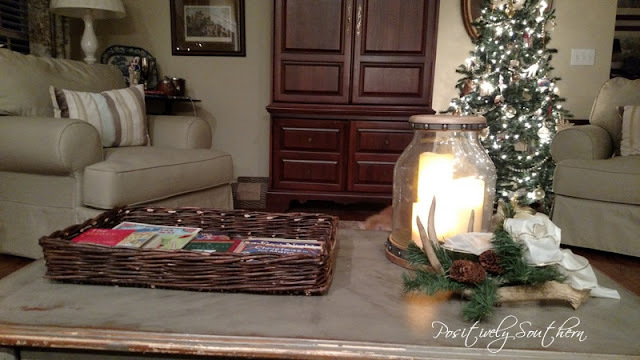 If you are coming over from Refresh Restyle an extra special thanks for stopping by! 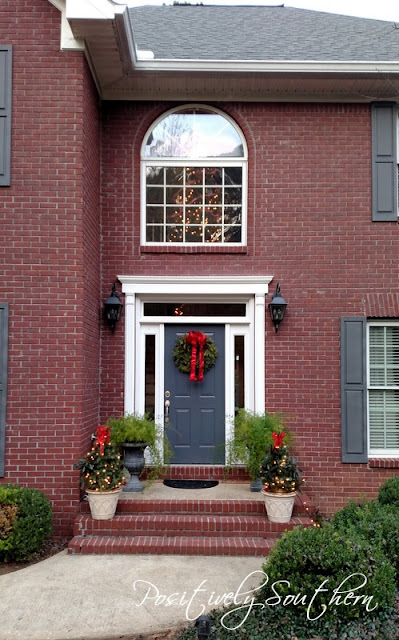 Decorating our front porch in this home always proves to be a challenge. The porch isn't covered so whatever I put out is going to be exposed to all the elements. I've always adored the lit Christmas trees on either side of the door. Come on in! 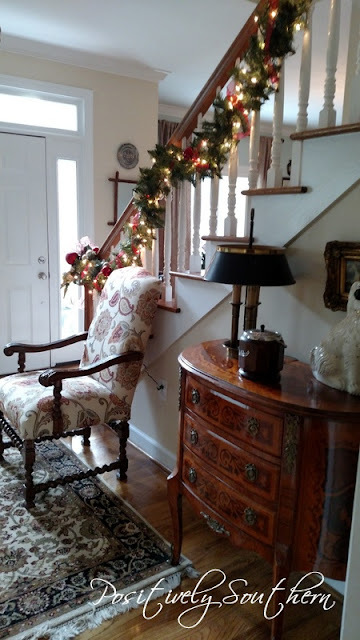 The foyer is the first stop as we enter our home. This year I decorated the garland with red and gold ornaments along with red ribbon. 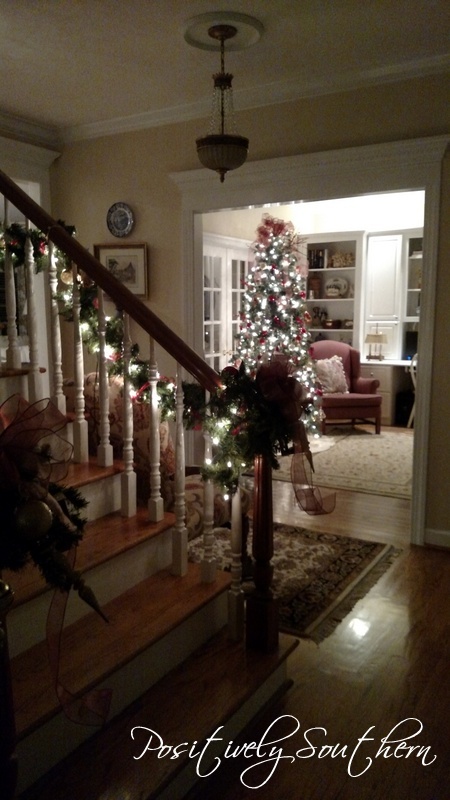 The ambiance that the glow of the lights adds to the entry is almost intoxicating. The pillars are adorned with small lanterns, ornaments and bows. This photo of the foyer gives you a glimpse into the dining room. The dining room gets its reveal next week during our tour. 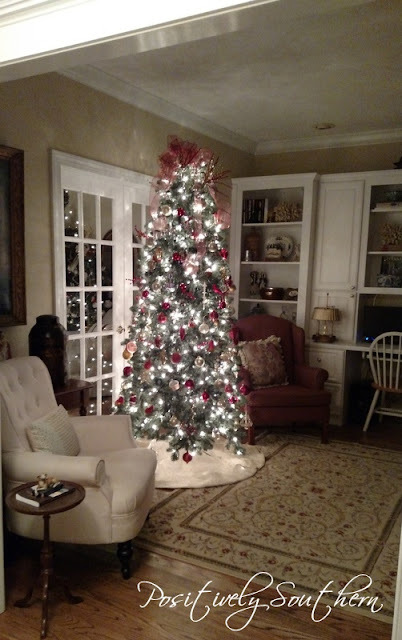 Our main tree sits in the living room in front of the french doors to the family room. 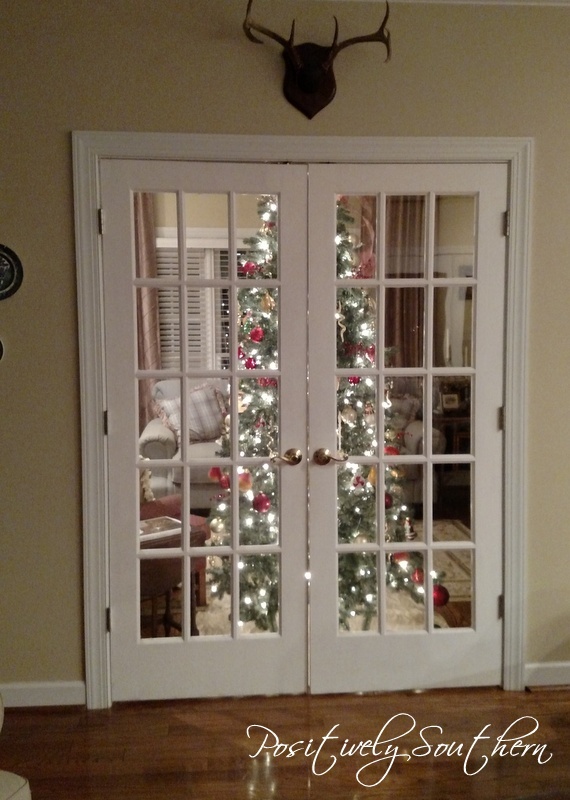 We placed it in front of those doors so it can be enjoyed from both rooms. 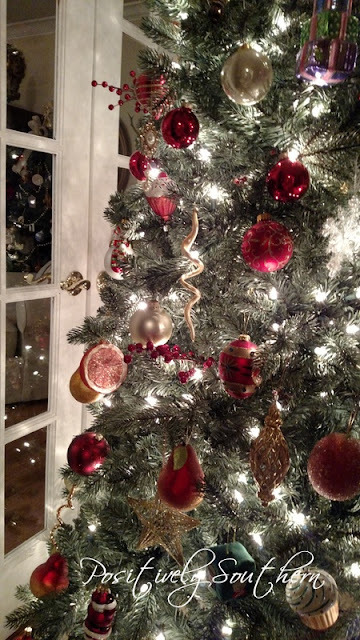 Reds, greens, golds and creams make up the sparkle and twinkle of this tree. 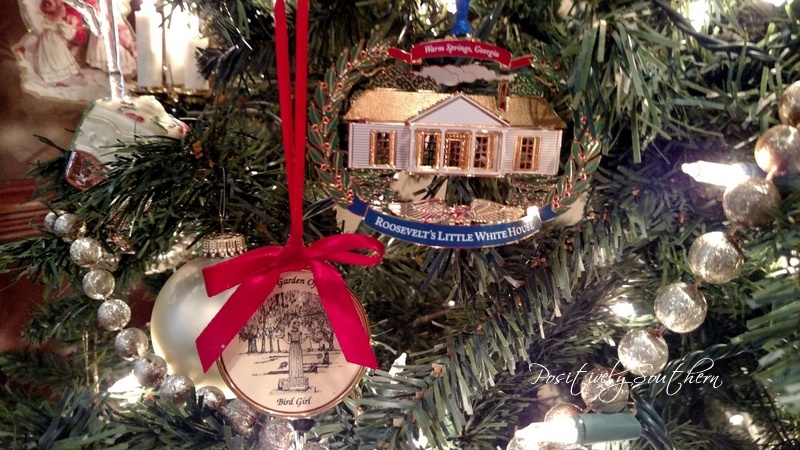 The ornaments have been acquired throughout our 25 year marriage. As you all know, I prefer a collected look and the Christmas trees are no exception. Moving to the family room, the mantel has been my fav spot to decorate this year. After scouring Pinterest for inspiration, I decided on a very natural look. 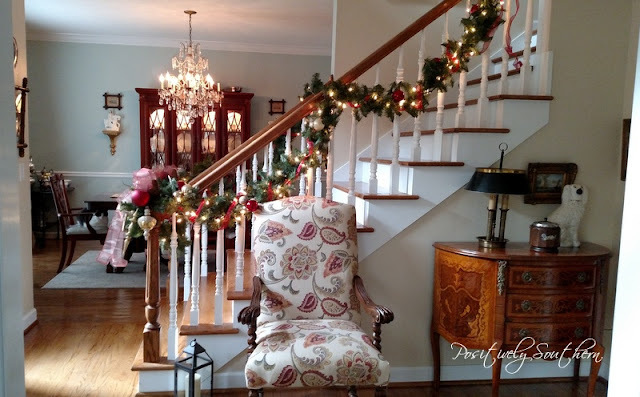 I started with 2 pieces of artificial garland. 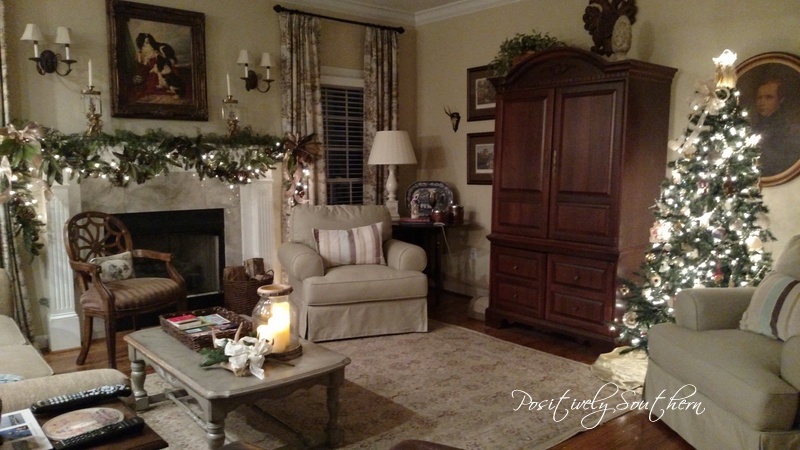 The garland was a perfect foundation to add natural elements to. Honey and I walked through the woods collecting magnolia branches and then moved into our own yard to pick up some other branches off our shrubs. When I had the curtains made for our family room I can't help but recall my interior designer telling me that I could absolutely positively never use red in this room....not even for Christmas. 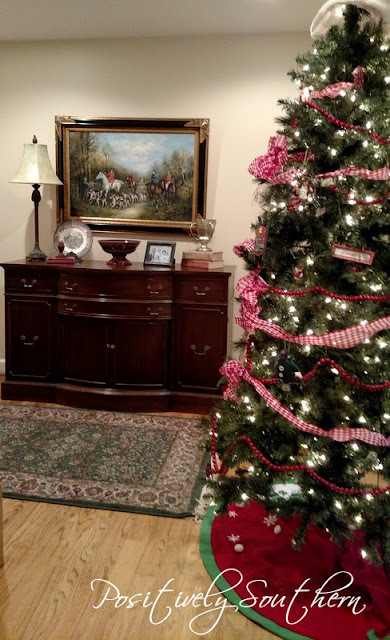 So as you move through the family room you will notice there isn't any red. The coffee table gets a real work out in our home so I had to keep it simple. 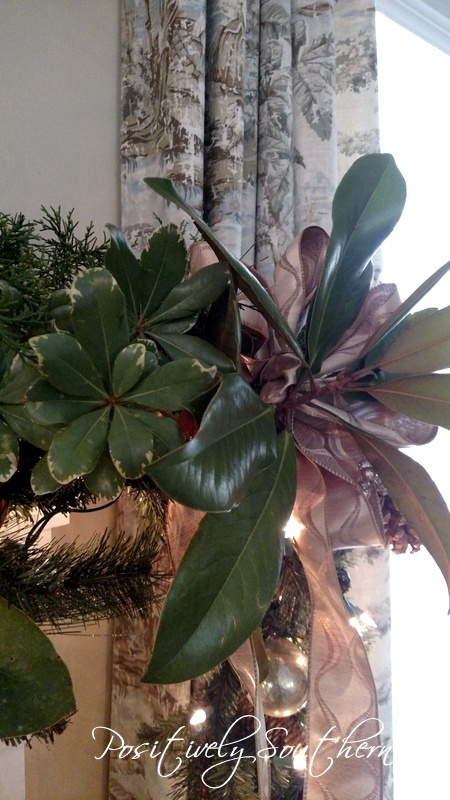 You will notice a hurricane with pillar candles, as well as faux greenery branch inside a real antler with a bow. 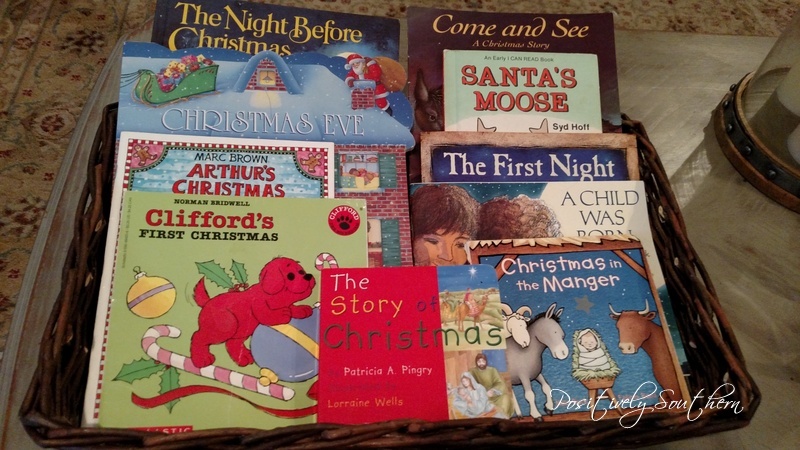 I tossed in a basket several of the boys books from Christmas past. Every year when I pull these books out I will find them each taking a peek at the Clifford and Arthur Christmas books...so I guess maybe they haven't outgrown them after all! The tree in the family room is a rather simple tree. We've tried larger trees but I always come back to using a smaller tree. 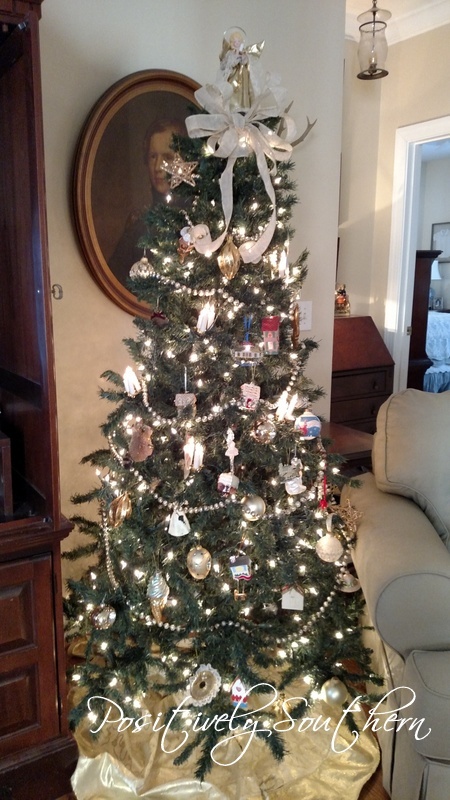 This tree is home to the ornaments that really mean something to us. There are ornaments for each house we have owned, our first Christmas together, as well as Baby's First ornaments for each of our boys. When we travel to a new place we try to make sure to get an ornament from that place so this tree has those hanging too. Let's climb the stairs and take gander at our final tree. This is the tree that sits in the window above the front door. This space isn't really a room and it isn't really a hallway, frankly I've never known what to call it. 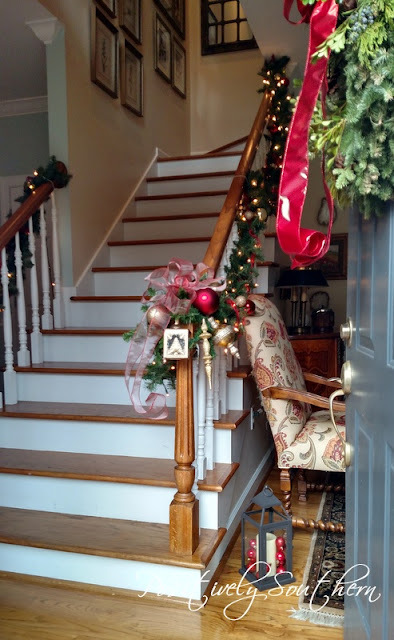 We most often refer to it as the upstairs foyer as it sits directly above the foyer on the main level. This tree changes decor almost ever year. 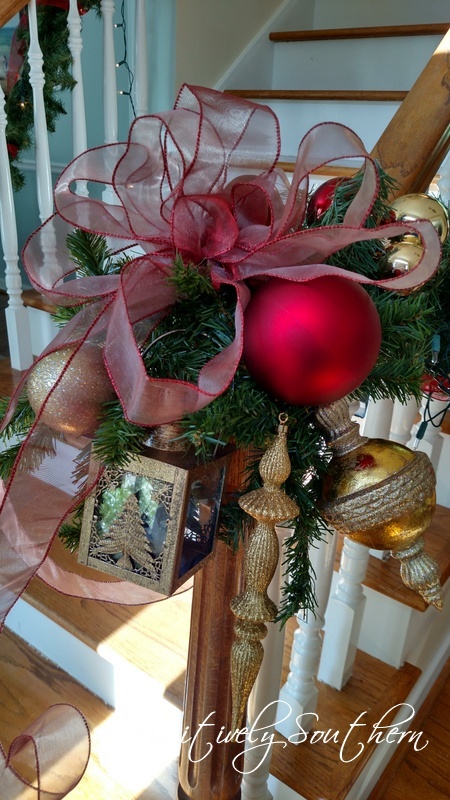 This year it has some of our "rustic" styled ornaments. Well ya'll that is it for today! On December 9th we will be sharing our entertaining spaces and tablescapes so you don't dare want to miss that! 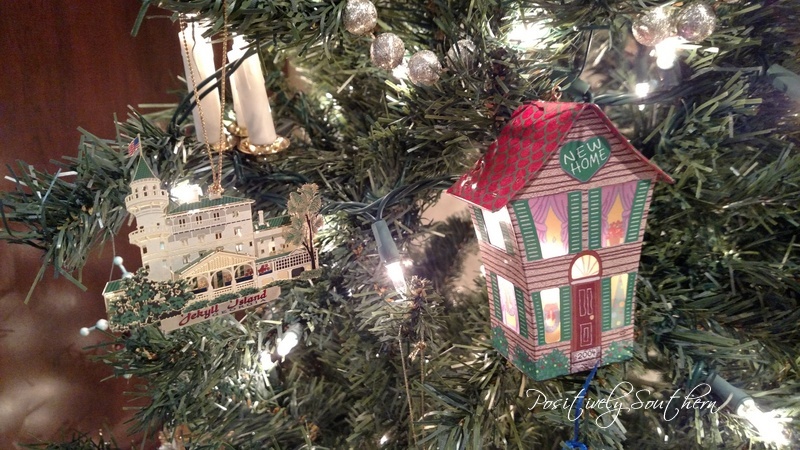 Be sure and hop right on over to Kate's blog at Chic on a Shoestring Decorating! She has lots of great spaces to show you! Just a reminder to make sure you check out our special hashtag #merryandbrightholidayhome to see everything we are posting on social media! Tamyra, It is stunning. 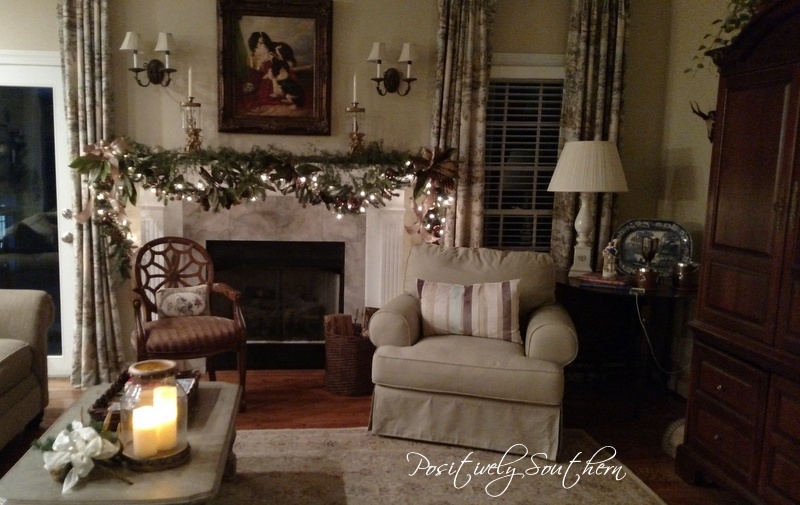 I love the family room especially that mantle. Your home is beautiful day and night!! Love it all, stunning! I just love your holiday decor. I too am a big fan of magnolia leaves and love the look they added to your garland. You've nailed every little detail. I can't wait to see what you have to unveil next week. Cheers to the season. p.s. I come thru Auburn often on my way to Montgomery to see family. We'll have to plan an outing next time I come thru. 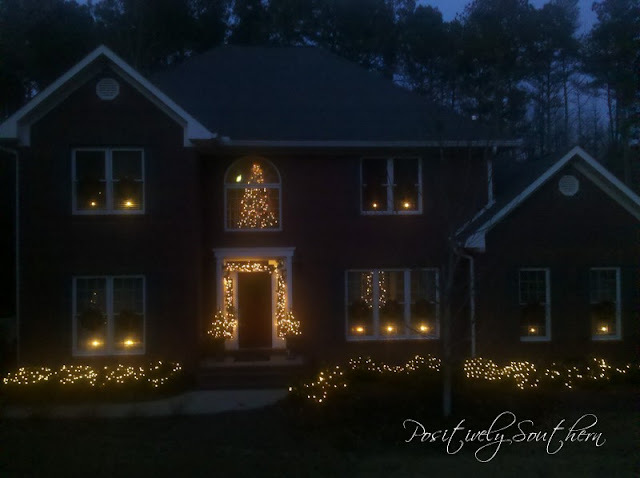 Tamyra - Love all the Christmas trees - your house must sparkle at night! 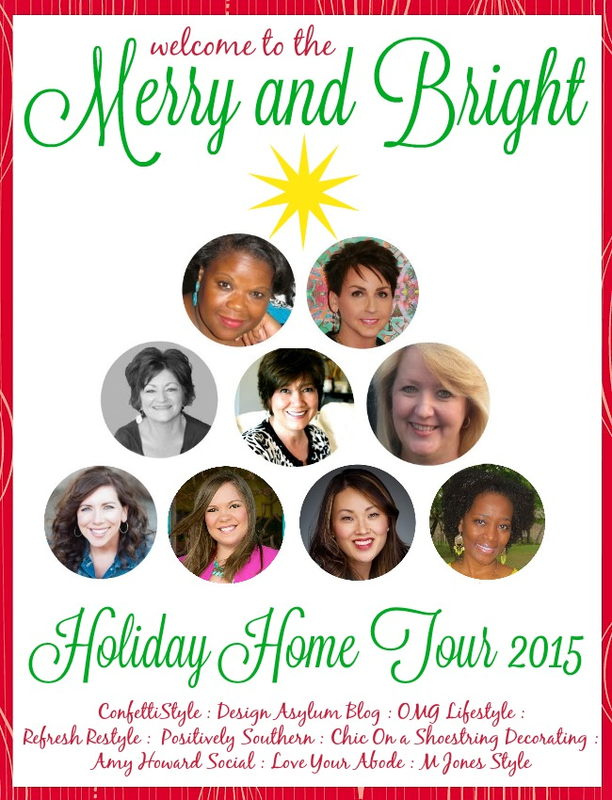 Enjoying meeting everyone through this holiday home tour! Just beautiful. Love all your trees and the natural garlands are gorgeous!! I thoroughly enjoyed the tour! We have some of the same collections! Can't wait to see the rest!